Rinse the rice well in cold water until most of the starch is removed. Heat the oil in a pan on a medium heat, and sauté the onions until brown. Add salt, pepper, cardamom, cinnamon and the cumin and cook until the onions are brown. Add the drained rice and stir for about 2-3 minutes. Add the water and chicken cube and stir in and cover, bring it to a boil and then reduce the heat. 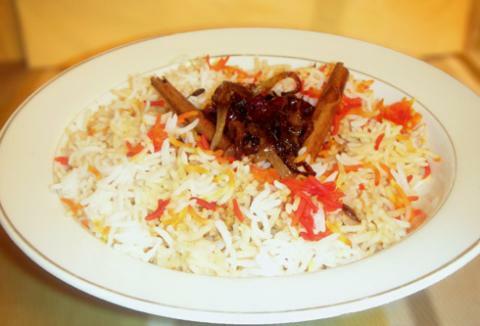 Continue to cook gently on a low heat until the rice is tender about 10 to 15 minutes. heat the oil over medium heat, add the onion and fry until nice and brown. Add the raisins and cook untill they puff up. Add this mixture over rice, add the food coloring on one side. Gently fluff the rice with a fork and serve.